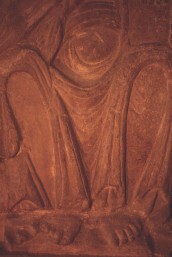 Carved panel of Christ in Majesty, detail of lower half. aisle of the Church in Barnack. This panel has a carving of Christ in Majesty, which is dated to the eleventh century. Christ is a bearded figure, seated on a throne. His clothing is draped over him and has unusual inverted folds (these may have been copied from a manuscript). His feet and hands are not covered. There is an object on his left knee, which may be a book (? ), and his right hand is raised, possibly, in blessing. Cramp, R.J., , ‘Tradition and Innovation in English stone sculpture of the tenth to eleventh centuries’. In Milojcic (1972) 139-148.